When October rolled around I had big plans to post a few of my favorite pumpkin recipes over Halloween weekend, but the month flew by in the blink of an eye and I never got around to it. 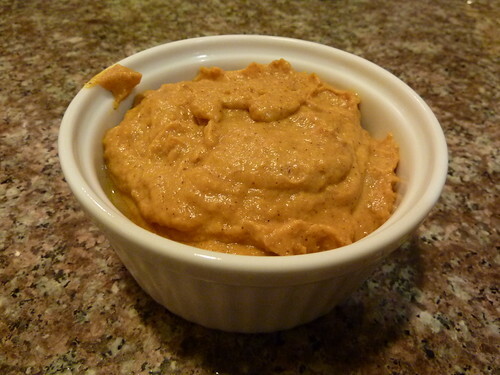 I did, however, make time to whip up a batch of pumpkin dip for our Hallowen party on November 6th. Pumpkin dip sounds healthy, right? Unfortunately, it’s pretty much just cream cheese frosting with pumpkin mixed in, but it’s absolutely delicious. Plus, it’s the perfect addition to a table of party food when paired with fruit or cookies. There’s probably a can of pumpkin in your cupboard so go make some right now! In a large bowl, beat the cream cheese and powdered sugar until creamy. (Add the vanilla extract during this step if it makes mixing the two together easier.) Gradually add the pumpkin, pumpkin pie spice, vanilla (if not added earlier), and ginger, and beat until smooth. Serve with fruit, pita chips, and/or cookies. Based on Taste of Home’s Harvest Pumpkin Dip.